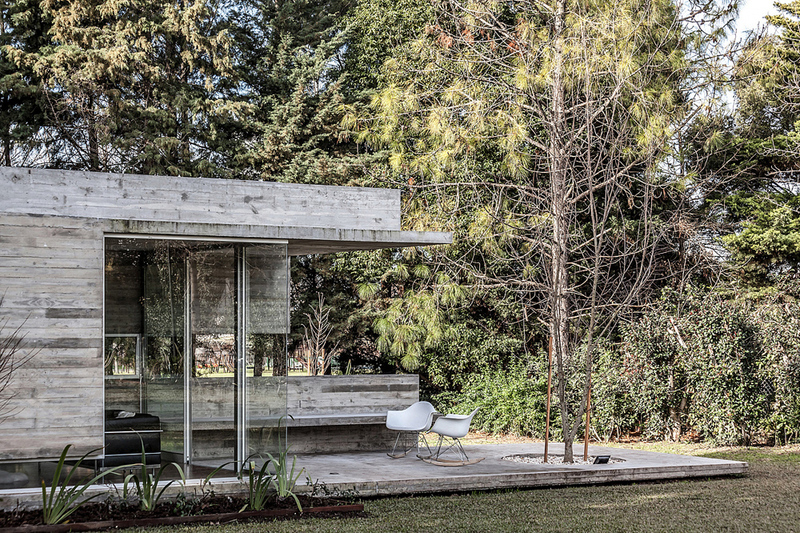 The Torcuato House Pavilion is designed not just as an extension to a main residence, but as a peaceful retreat that provides a space for reflection and nature contemplation. The project was completed by Besonias Almeida Arquitectos, an architecture practice based in Buenos Aires, Argentina. Built near evergreen trees on a plot of land located farthest away from the main house, the new structure allows the clients to enjoy a moment of peace and take a break from the fast-paced modern lifestyle. Natural wood, glass and concrete are used in tandem to create a warm and stylish space. The minimal use of furniture enhances the relaxing ambience of the interior, along with the fireplace and integrated bench which extends to the outdoor area. A warehouse is hidden at the rear of the extension, while a bathroom can be accessed via a discreet passage. More than just an extra living space, the structure successfully combines areas that offer visual and acoustic privacy with openings and outdoor spaces that establish a close relationship between inhabitants and nature in a beautiful private retreat.